but the future does not yet exist. 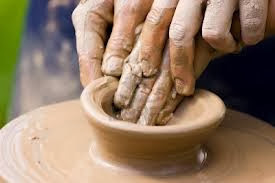 by taking the materials of the past and working with them in the present. in the shaping of God's intent for ourselves and for creation. What a Sufi Muslim, a Star Trek episode, Guinea worm eradication and the Apostle Paul have in common. In a recent blog post, I recalled my encounter with Feisal Abdul Rauf, a Sufi Muslim who was, at that time, the Imam of the “Ground Zero Mosque.” What made the encounter so powerful for me was a combination of story and experience. Hearing Rauf tell his story and also experiencing the presence of God as Rauf (and other Muslims) worshiped, contributed greatly to a paradigm shift I have undergone in my views about other faiths. Rauf effectively built a bridge of affinity which helped me further in seeing Islam not as a religion to fear or despise but as a faith worthy of respect (even if I myself do not choose to follow it) and a potential ally in mending the world. This idea of the power of story combined with experience brings to mind to an episode of Star Trek: The Next Generation, entitled Darmok. In that episode, the crew of the starship Enterprise make contact with an advanced race called the Tamarians, about whom little is known. The Tamarian space ship and the Enterprise rendezvous in orbit above a planet called El-Adrel and attempt to communicate, in hopes of establishing diplomatic relations. What makes this challenging is that both sides are wary of the other and are completely unable to understand the communication style of the other, even though they can speak the same language. The Tamarian form of communication is comprised entirely of metaphoric references to their history and myths. Where a human might say “Let’s work together to solve this problem,” a Tamarian would say “Darmok and Jalad at Tanagra.” Since humans have no knowledge of Tamarian history and mythology, they are at a loss to decipher the references. Who is Darmok? Who is Jalad? What did they do at Tanagra? The Tamarian captain, Dathon, frustrated at the communication conundrum, decides to take bold action. He has himself and Captain Jean-Luc Picard of the Enterprise “beamed” down to the planet below. Further, he has the signals of the Enterprise jammed so that they cannot contact or rescue their captain. 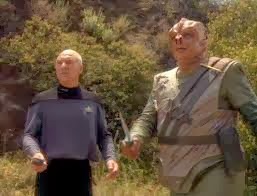 On the planet, Dathon approaches Picard and tosses a dagger to him, saying “Darmok and Jalad at Tanagra!” Picard thinks the Tamarian is challenging him to a duel and refuses to pick up the dagger. It turns out that there is a dangerous creature nearby on the planet, which is aware of the presence of the two captains and is approaching in order to attack them. It can only be defeated if Picard and Dathon fight it as a team, using their daggers. Picard eventually realizes that what the Tamarian captain is doing is instigating a shared experience which will give them a new story in common. The finale of the episode is when, after battling the creature, the humans are able to say to the Tamarians "Picard and Dathon at El-Adrel," thus establishing a foothold for further dialogue. “The Guinea worm is one of the largest human parasites (it can grow to three feet long), and it has caused incalculable pain and suffering in millions of people. When West Asian and sub-Saharan villagers drink stagnant and unfiltered water, they take in the larvae of the Guinea worms, which then burrow into abdominal tissues and slowly grow into enormous worms. Eventually the worms begin to excrete an acid-like substance that helps carve a path out of the host human’s body. Once the worm approaches the skin’s surface, the acid causes painful blisters. To ease the horrific pain, victims rush to the local water source and plunge their worm-infected limbs into the pond for cooling relief. This gives the worm what it wanted—access to water in which to lay hundreds of thousands of eggs, thus continuing the tragic cycle. What a team of researchers discovered was that the cycle of Guinea worm infection in humans could be stopped in its tracks by getting people to change just two behaviors for the span of as little as one year: straining their water before drinking it and preventing infected people from going into the watering holes. The challenge was how to get 120 million people, many in remote villages, to change these two behaviors. Health workers were deployed to disseminate information to the villagers, but their efforts to bring about the necessary behavioral changes failed. It was only when they implemented a strategy incorporating story and experience that they began to see results. The modus operandi they found to be successful was to have a highly respected figure (often a politician or military general or other celebrity) visit a village. The celebrity, along with the village headman (who had been convinced beforehand of the need for change) would give information to the gathered villagers (who had come to see the celebrity) about the Guinea worms. Then water would be taken from the local source and poured into a large glass container. A magnifying glass would be set up in front of the container and the villagers would peer into it, enabling them to see—for the first time—the larvae in the water. Next, the water in the container would be poured through a cloth strainer into another glass container. The magnifying glass would now be placed in front of the “clean” container and the villagers could see that there were no larvae. Finally, as the coup de grace, the celebrity and the village headman would both drink from the container of filtered water. Then the villagers would be invited to partake of the same water. By giving the villagers a compelling story tied to a memorable experience, behaviors changed. As a result, the health workers have managed to nearly eliminate Guinea worm infections in Africa. While Paul was waiting for them in Athens, he was deeply distressed to see that the city was full of idols. So he argued in the synagogue with the Jews and the devout persons, and also in the marketplace every day with those who happened to be there. Also some Epicurean and Stoic philosophers debated with him. Some said, “What does this babbler want to say?” Others said, “He seems to be a proclaimer of foreign divinities.” (This was because he was telling the good news about Jesus and the resurrection.) So they took him and brought him to the Areopagus and asked him, “May we know what this new teaching is that you are presenting? It sounds rather strange to us, so we would like to know what it means.” Now all the Athenians and the foreigners living there would spend their time in nothing but telling or hearing something new. Initially, the Stoic and Epicurean philosophers who encountered Paul in the agora thought he is a spermalogos—a “seed-spitter” or “babbler”— in other words, someone who was throwing out words but didn’t really understand what he was saying. Paul was taken to the Areopagus (Mars Hill), where the city council met, ostensibly to determine if his preaching should be permitted or if he was proclaiming a religio illicita. Much hinged on how Paul would answer the questions put to him regarding the nature of the message he had been proclaiming. Paul responded in a way that was respectful, crafty and conducive to ongoing interfaith dialogue. He evoked one of the legends of their city and linked it to his own proclamation. The legend involved the semi-mythical Cretan prophet, poet and philosopher Epimenides. In the 6th or 7th century BCE, so the story went, a terrible plague came to Athens, killing thousands. Sacrifices were made to various gods and goddesses, but the plague did not abate. It was discerned by an oracle that some offended deity remained unappeased. The city leaders sent to Crete for Epimenides to solve the conundrum. Upon arrival in Athens, Epimenides requested that sheep be brought to the Areopagus and then set loose to graze. Wherever a sheep lay down, he instructed, an altar was to be erected and the sheep was to be sacrificed upon it. His advice was followed and the plague subsided. The result of this event, according to Diogenes Laertius (who wrote of it in the 3rd century CE), was a scattering of altars throughout Athens which were unassigned to any particular deity. Having established a connection, Paul next attempted to push things in a new direction by speaking about the resurrection of Christ. At this point in Luke’s narrative of Acts, the Areopagus interview ends in dispute (Platonic-minded Athenian philosophers would have found the idea of a bodily resurrection to be unappealing). But Paul seems to have achieved his objective, as some on the council expressed an interest in hearing more of his message and a few became followers of Jesus. A door was opened; a dialogue established. Paul tapped into the power of story and experience in order to build a bridge between their worldview and his. These examples seem to point a way forward in our pluralistic and often polarized world where fear and ignorance about “the others” results in tragedy and loss to us all. We can, like Paul, learn about “the others”—-be they Muslims or gays or undocumented immigrants or whomever. We can listen respectfully and attentively to their stories and, in so doing, realize our common humanity. And perhaps, if we comport ourselves appropriately, we can be invited to share our stories too and maybe together share an experience of the God in whom we all live and move and have our being. 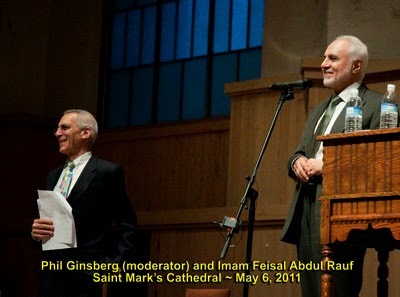 My Encounter with the Imam of the "Ground Zero Mosque"
In May of 2011 I went to St. Mark’s Episcopal Cathedral in Seattle to hear Imam Feisal Abdul Rauf speak at a conference entitled Confronting Islamophobia. At the time, Rauf was the Imam of the much maligned “Ground Zero Mosque” (more accurately named Masjid al-Farah) in New York City and I was curious to see what all the fuss was about. The host for the evening, a Jewish man named Phillip Ginsberg (who is a board member of the Interfaith Coalition for Human Rights), opened with prayer and then introduced Rauf as a close friend. The Imam himself was a distinguished older gentleman; well-dressed, thoughtful and soft-spoken. He gave a prepared speech lasting about 30 minutes and then spent another hour answering questions from the audience. I was impressed that, even when confronted with ignorant and accusatory questions (“How can you call Islam a religion of peace?”) he maintained an air of calm patience, earnest humility and intellectual prowess. In his prepared speech, Rauf emphasized the commonalities shared by the three Abrahamic faiths. He began by praising the opening invocation given by his Jewish friend. Rauf then expressed his belief that all were gathered in that place that evening in the name of the One God: “The God of Adam, Noah, Abraham, Ishmael, Isaac, Moses, Aaron, Jesus, Mary and Mohammed.” In saying this, he deftly set the theme for his presentation. Rauf spoke of the intertwined histories of Judaism, Christianity and Islam. 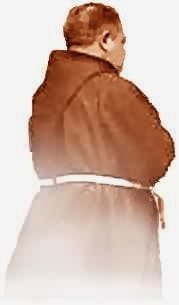 He then focused on the shared values and principles in the areas of theology and jurisprudence among the three faiths. He outlined similarities between the U.S. Declaration of Independence and the statutes of Sharia law which mandate protection and respect of life, dignity, property, intellect, family and religion (including religious liberty and freedom of conscience). He pointed out that the Golden Rule is central to all three Abrahamic faiths. Rauf expressed his belief that these are commonalities upon which dialogue and peaceful coexistence can be built. He closed his speech by quoting and concurring with Isaiah’s vision of a time when nations will no longer practice war. Together—-he pointed out—-Jews, Christians and Muslims comprise over half of the world’s population and share much in common in the way of God-inspired compassion, caring and spirituality. Together, these three faiths can dramatically impact the world for peace, justice and prosperity. After answering a few questions, it was pointed out by the Jewish host that it was time for the Muslims to engage in their evening prayer. The audience was asked to sit quietly or step outside while this occurred. The Muslims in the audience gathered in rows behind the church’s dais in preparation. Ginsberg took Rauf by surprise (it appeared) when he asked him to give the adhan, the call to prayer. A holy hush came upon all as Rauf’s beautiful chant reverberated through the cathedral. I, and the three other Quakers with me, had a powerful sense of the Divine presence and we knew that this man was worshipping in spirit and in truth, and that God was honored. 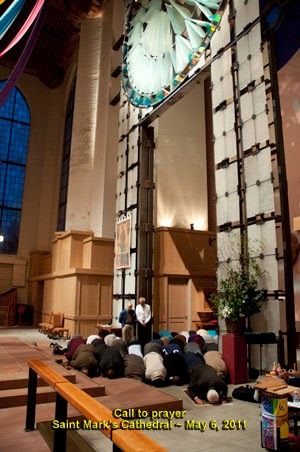 We sat silently in our pew, worshipping in the manner of Friends, as the Muslims stood and then knelt and then bowed repeatedly in prayer within an Episcopal Cathedral. After the prayer time, Rauf took the podium again to answer more questions. I was particularly struck when, in response to a question which I cannot recall, Rauf gave what we Christians would call his testimony. He described how he was raised as a Sufi, a mystically-oriented branch of Islam, but did not have an experience of God until he was 14 years old. The encounter happened quite unexpectedly; while riding on a bus. He said that for a moment, “the boundaries of my ego—the boundaries of myself, dissolved. I felt a oneness with the universe and the enormous compassion and love of God.” This was an experience, Rauf explained, which continues to anchor him. Having had a very similar experience myself, I knew exactly what he meant. 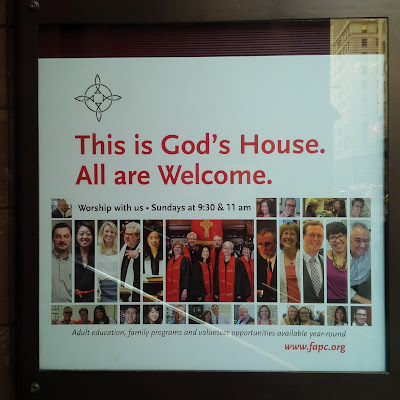 This is religion, he said, which is “from the inside out, not the outside in.” These are words which could have been spoken by George Fox or Ignatius of Loyola or many other holy persons throughout history. During the Q&A session, one member of the audience identified himself as a Quaker and then proceeded to launch into a litany of accusations against Islam. My Quaker companions and I were mortified. Rauf appeared unperturbed and responded to the diatribe patiently and gently. In analyzing what made this event so impactful for me, it was the combination of story and experience. Imam Rauf gave a compelling narrative of how Judaism, Christianity and Islam could not only coexist peacefully but work together to bring peace and healing to the nations. This is a man who "walks his talk." He has the credentials of a long history of interfaith dialogue and action (including representing the U.S. to Islamic nations for the State Department). But the real impact for me was when Rauf told his own personal story of encountering the presence of God and being transformed by that encounter. His description was akin to those from every religion who have experienced the Divine (regardless of what name they use). But what impacted me the most was the experience of seeing the man worship and feeling the presence of God—the same presence that I know from my own worship—descend upon us all. After hearing and experiencing that, how could I hold to the notion that those who practice a faith other than mine are shut out from God? I've been studying Pelagius, the 4th/5th century stout British scholar/monk and arch-heretic who, it turns out, wasn't such a heretic after all. Much of Pelagius's writings were destroyed but, ironically, were also preserved in quotes within the writings of his opponents (such as Jerome and Augustine) and have been stitched back together. Jerome, who could be quite caustic to those who disagreed with him, referred to Pelagius as "a huge, bloated, Alpine dog, weighed down with Scottish oats..." Interesting that these revered ancient saints were not above cheap shots and argumentum ad hominem, not unlike modern exchanges on Facebook and the Internet.